Animal Wildlife | Fennec Fox | The fennec fox is a small species of canine found in the dry, sandy regions of the African Sahara Desert. 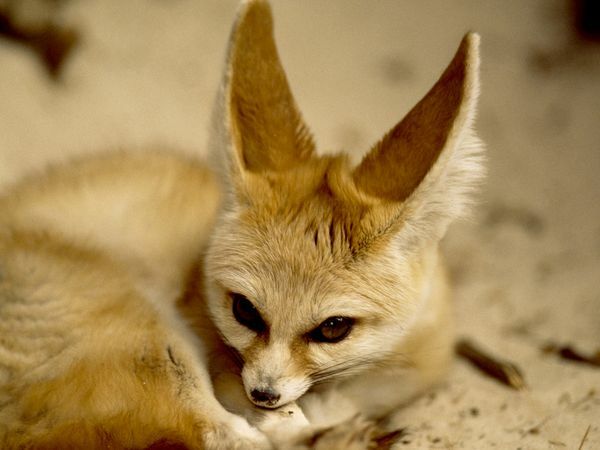 The fennec fox is most well known for it's large ears which can be half as long as the body of the fennec fox. 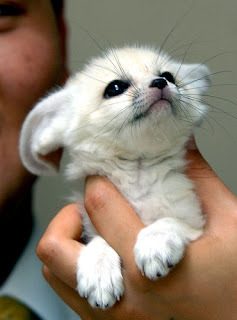 The fennec fox is the smallest fox in the world, with fennec fox individuals ranging from 24 cm to 41 cm in length. The fennec fox also has a remarkably long tail which ranges in length from 18 cm to 31 cm depending on the size of the fennec fox individual. 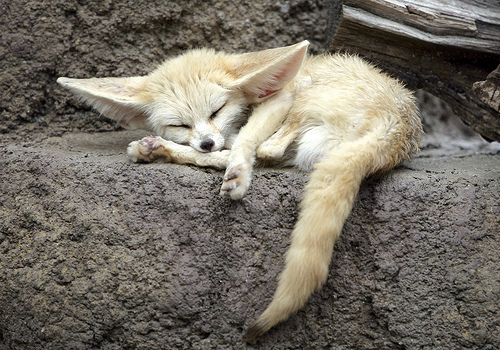 The fennec fox has thick fur which helps to keep the fennec fox cool in the day and warm during cold nights. 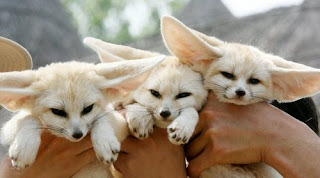 The large ears of the fennec fox help to regulate the body heat of the fennec fox helping to keep the fennec fox cool during the hot daytime hours. This is done by blood running near the skin in the ear. This helps dissipate the heat. The fennec fox is an omnivorous animal and it's diet mainly consists of insects, rodents, plants and fruits along with small reptiles and the occasional egg. The fennec fox has sandy coloured fur which helps to keep the fennec fox camouflaged when it is hunting. The sandy colour of the fennec fox's fur also helps the fennec fox remain unseen from predators. A female fennec fox is able to breed twice a year but most female fennec foxes only breed once a year. The female fennec fox gives birth to 3 to 4 baby fennec foxes, known as kits. The fennec fox kits feed on the milk from the mother fennec fox for about a month while the mother fennec fox keeps male fennec foxes out of the den. When the kits are old enough they start to hunt with their mother. 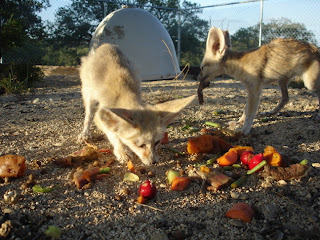 Fennec foxes are known to live in small communities together of up to 10 fennec fox individuals. Fennec foxes are nocturnal animals meaning that they sleep in their burrows during the day and hunt for food above ground when it is dark. 0 Response to "Fennec Fox"